Juventutem is a group of Catholic young adults who pursue holiness by attending the Traditional Latin Mass and by tapping into other timeless traditions of the Faith. Young adult members of the Fœderatio Internationalis Juventutem work for the sanctification of youth – both at the triennial World Youth Days as well as in the local dioceses and parishes. As part of this year’s October pilgrimage, George cardinal Pell will celebrate a Solemn High Mass for Juventutem on Friday, October 24th, at 6:30 p.m. at Santissima Trinità dei Pellegrini, a personal parish established by the Bishop of Rome for the celebration of the Extraordinary Form of the Roman Rite. In Rome, 23-25 October, a pastor has agreed to make his parish gymnasium available to backpacking Juventutem members, at near-gratis rates. Fr. Armand de Malleray, FSSP, the ecclesiastical assistant of the FIJ, will be present in Rome and will provide spiritual conferences for those young adults who gather for this General Assembly of Juventutem. To the extent that we are joined by young adults from Poland, we hope to begin serious discussions of the Juventutem presence at WYD Krakow. Young adults who intend coming to Rome, are invited to fill in this questionnaire. 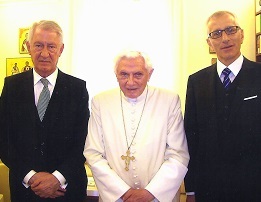 On September 1, 2014, Pope Emeritus Benedict XVI met Cosimo Marti, the Treasurer of Juventutem, and Giuseppe Capoccia, General delegate of the pilgrimage. This entry was posted in #sumpont2014, Non classé. Bookmark the permalink.